You love your dogs but that doesn’t necessarily mean you enjoy cleaning up their mess. Let Loren’s Pooper-Scooper Service assist you with the dirty work. We’ll provide you with fast and reliable pet waste and odor removal services leaving your yard looking good and your trash without odor. We are very detailed and take pride in our work. We are dedicated to helping you enjoy valuable time with your family and pets. Our poop removal experts will save you time to relax. You and your neighbors will love and appreciate the look of your clean yard. We provide prompt, professional, and affordable services. Our services are not limited to dogs. We also work with cats, pot-bellied pigs, tortoises and other small pets. If you’re a senior citizen or are disabled, Loren’s Pooper-Scooper offers a 10% discount. Call us to learn more. Get 4 weeks free- ask us how! tHINKING OF REPLACING YOUR CARPETS? We can help eliminate odors from your concrete slab BEFORE you install new flooring. Click here for more info. 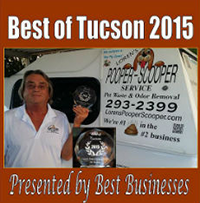 Loren’s Pooper-Scooper Service has been Tucson’s pioneer pet waste removal company since 2001. We are not a franchise, but locally owned and operated by a U.S. Army veteran. We work, play, spend locally. We volunteer our services for many pet-related organizations throughout the Tucson area. We are very detailed and take pride in the work we do. You love your dogs, but don’t always love cleaning up after them. We pride ourselves on providing prompt, professional, and affordable pet waste removal services. Contact us today to schedule your pet poop pickup services! When you call us, you speak directly with Loren, the owner, to get the answers you need. We have over 15 years of experience in our field. Each and every year you have service.